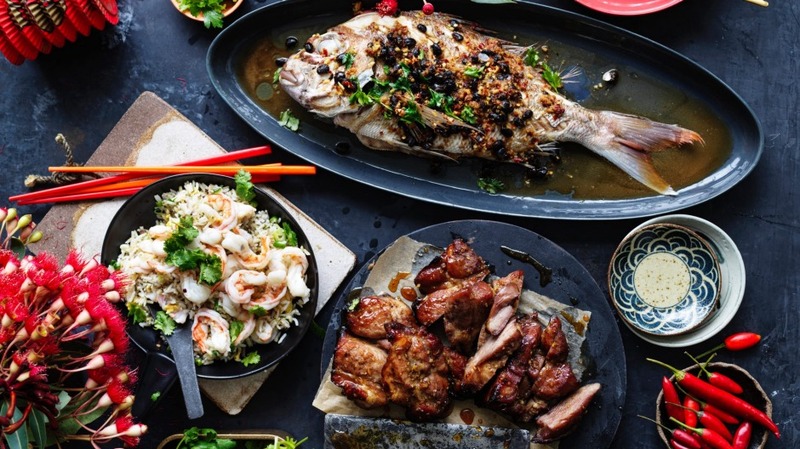 Chinese New Year is traditionally a time of reunion and thanksgiving, when migrant workers in China, as well as overseas, travel home for dinners with their families. More food is consumed during the New Year celebrations than at any other time. I celebrate Chinese New Year with my extended family – a large, noisy, wonderful gathering with food and family at the centre. I hope you enjoy cooking and sharing some of my favourite New Year dishes. May 2019 bring health, happiness and goodness to all. Ask your fishmonger to scale and gut the fish for you. A plate-sized fish fits comfortably within a domestic bamboo steamer and of course, you can apply this same recipe to fish fillets. 1. Bring a large saucepan or wok of hot water to the boil. 2. Pat fish dry with kitchen paper and place on a chopping board. Using a sharp knife, make four diagonal slits on one side of the fish. Turn fish over and repeat on other side. 3. Place fish in a shallow heatproof bowl that will fit inside a steamer basket. Combine ginger, garlic, black beans, chilli flakes and sugar in a bowl and spread mixture evenly over the fish, pressing it into the slits. 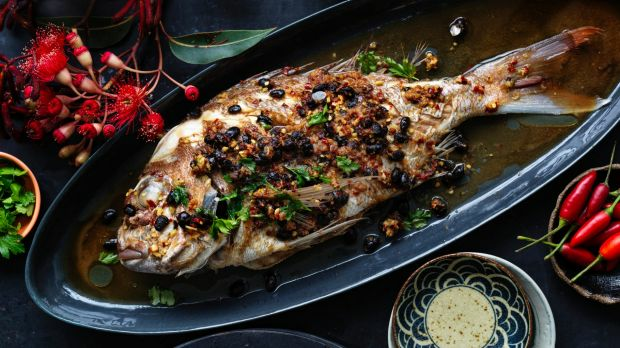 Pour wine or sherry over the entire fish. 4. Place bowl inside steamer and cover with the lid. Position over the pan or wok of boiling water and steam for eight minutes or until fish is cooked. The flesh should be white; if it is still translucent, cook for another minute or so. 5. Carefully transfer the cooked fish to a serving platter. Pour all the cooking juices over the fish, along with the soy sauce, and scatter with sea parsley leaves. 6. Heat oil in a small saucepan until smoking hot, then pour over the fish to scald and sear the sea parsley. Serve immediately. To celebrate Chinese New Year, I add super fresh king prawns to my basic fried rice recipe. For a more luxurious version, sear fresh scallop flesh as well, and sit it on top, with a dollop of XO sauce. 1. Peel, de-vein prawns and cut into three, lengthways. 2. Break eggs into a bowl and beat lightly. Heat half the oil in a hot wok until surface seems to shimmer slightly. Pour beaten eggs into wok and leave to cook on the base of the wok for 10 seconds before folding egg mixture over onto itself with a spatula and lightly scrambling for about one minute or until almost cooked through. Carefully remove omelette from wok with a spatula and drain on paper towel. Set aside. 3. Heat remaining oil in hot wok and stir-fry prawn meat for three minutes or until cooked. Remove and drain on paper towel. 4. In remaining oil (add more if necessary) stir-fry onion, ginger, garlic, coriander roots, stems and bacon for one minute. Pour in wine or sherry and stir-fry for one minute. 5. Add rice to wok with spring onions, soy sauce, sesame oil and reserved omelette and stir-fry for two minutes or until well combined and rice is heated through. Use a spatula to break up the omelette into smaller pieces while cooking. 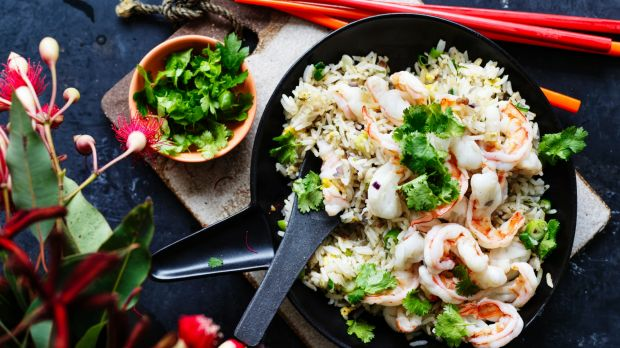 Transfer rice to a bowl and serve with prawns on top, garnished with coriander. 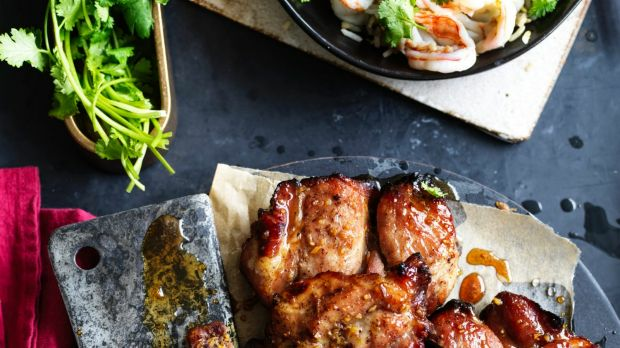 This simple recipe, an homage to my Aunty Gladys, works best when you source the best quality pork you can find and marinate it overnight. Any leftovers are perfect the next day for pork fried rice, or pork and prawn omelette. 1. Combine pork with marinade ingredients in a large bowl, cover and leave to marinate in refrigerator overnight. 2. Next day, preheat oven to 190C. Remove pork from the fridge and bring to room temperature. Reserve the marinade. Place pork on a wire rack inside a roasting tin, then fill the tin with water to a depth of 4cm. 3. Roast the pork for eight minutes, then turn the meat over and baste with generous amounts of the reserved marinade. Roast for a further eight minutes, then baste again. Turn oven to 220C and roast the pork for 8-9 minutes or until cooked. Remove pork from the oven and allow to rest in a warm place for 10 minutes. Cut into slices about 1cm thick and arrange on serving platter.